We went to Phnom Penh to get more pages added to my passport. Unfortunately, the US consulate did not have an open appointment for four weeks. Big problem. We talked to a visa agency and they assured me that there was a way for the Vietnam embassy to add a visa to my passport even though I didn’t have any more visa pages for an extra $20. Like most things visa agents say, this was only half true. They just ended up sticking the visa on one of the amendment pages where it is not supposed to go. No, I didn’t pay the extra $20. I just crossed my fingers and hoped that this would not cause a problem later. 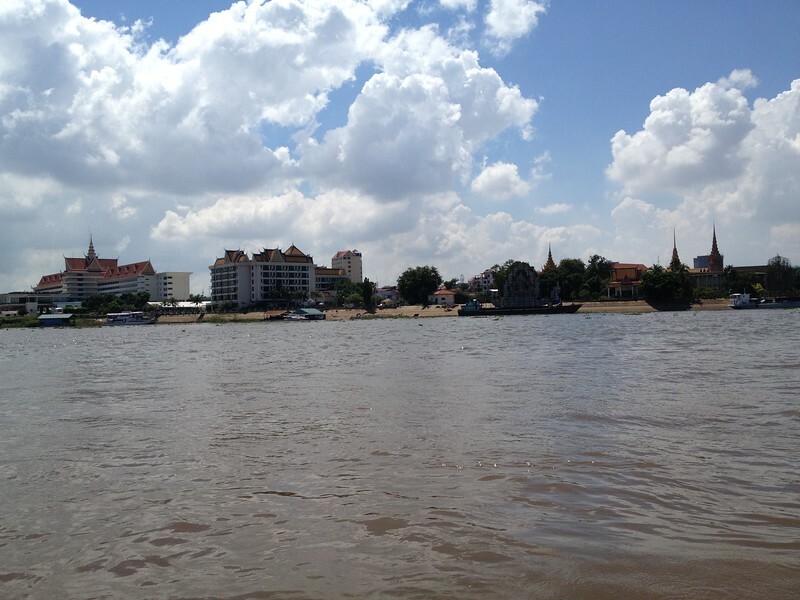 Tired of buses, we decided to take the Hang Chau speed boat from Phnom Penh to Chau Doc, Vietnam. We paid $24 each for just passage to Chau Doc. 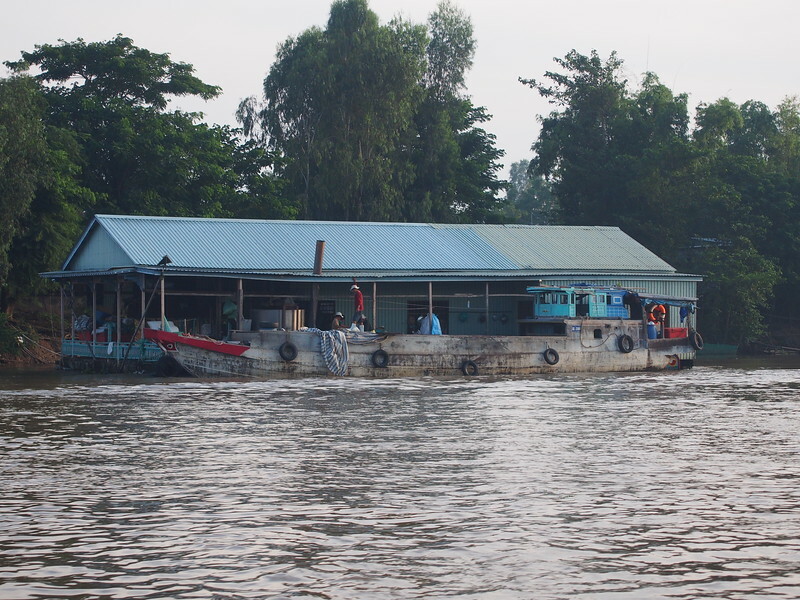 The boat leaves Phnom Penh at noon and takes around 5 hours to arrive in Chau Doc. Other passengers on the boat with us had paid more for a package that also included accomodation at the Victoria Chau Doc Hotel but I was pretty sure that we would be able to find something once we arrived and just wrote down a few hotel names. Leaving Phnom Penh by speed boat. The first few hours are pretty boring. You will pass a few fishing boats but the villages on the shore are far in the distance and there is not much you can see from the boat. There are soft drinks and beer for sale but the only snacks were the free crackers and an overripe banana that were provided with the ticket. The view for the first half of the trip. The boat will first stop at the Cambodian border to put an exit stamp in your passport, which took less than 15 minutes for our group of 12, and then goes on to the Vietnam border which takes quite a bit longer. There is no visa on arrival for Vietnam so you will need to have already arranged a visa in Phnom Penh. As you get closer to Chau Doc, the scenery becomes much more interesting. That branch of the river narrows and you get a good view of the villages along the riverfront. 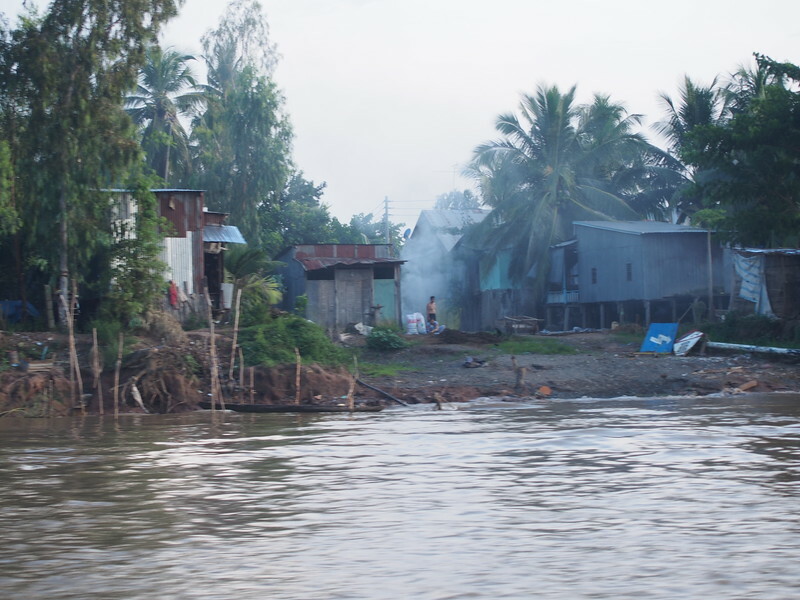 People are bathing in the river or washing clothing. Small children are always sure to wave at the passing boat. Village along the riverfront on the way to Chau Doc, Vietnam. Sorry for the blur. Fishing boats along the river. Floating house near Chau Doc, Vietnam. The floating house in the photo above is quite near the shore, but we saw clusters of floating houses much farther out. Basically, they are built on a wooden raft platform and there are usually fishing nets strung beneath them. The boat dumps you out on a dock somewhere in Chau Doc and there are bicycle rickshaws waiting to take you to your hotel. Make sure that you have the names of a few hotels written down to show the driver because you will have no idea where you are. 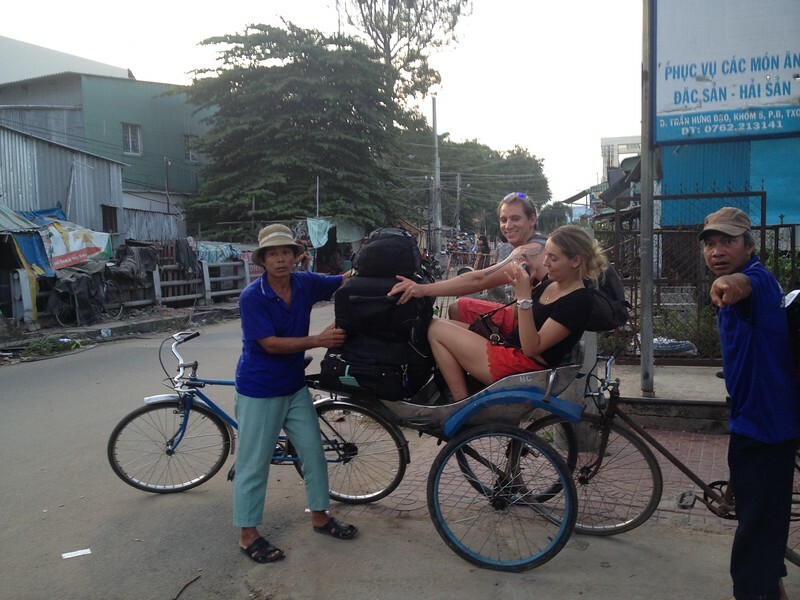 An Australian couple that shared the boat ride with us tries to fit all their luggage on the rickshaw. The baby and I were pushed onto the first of the waiting rickshaws and most of the time I had no idea if Micheal was still behind us. I was far too busy trying to keep myself (with the baby in the sling) and my suitcase balanced on the back of this shallow little cart. Vietnam hits you all at once: the clothing people are wearing, the colours of the buildings, the smell of cooking food. 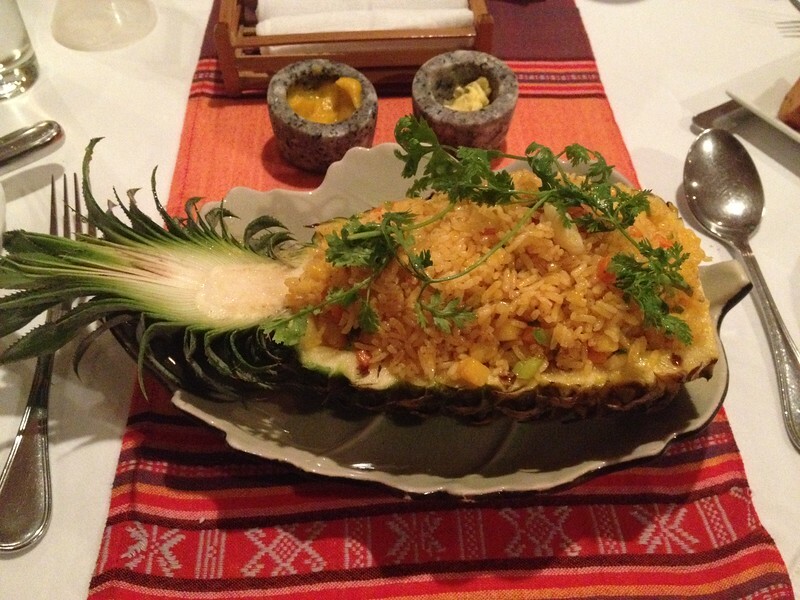 Everything is so distinct and different from either Thailand or Cambodia. Micheal helping to push the rickshaw down the gravel covered road. 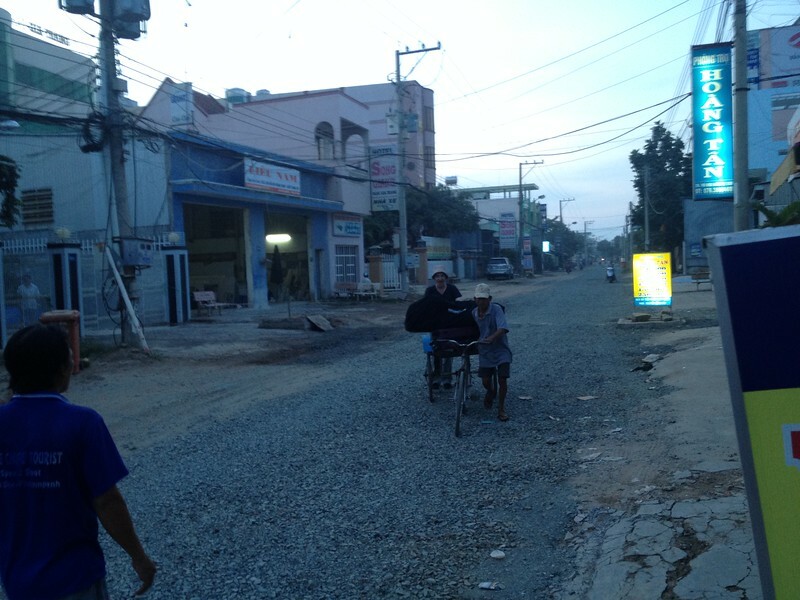 We got to the hotel about 5 minutes before we saw Micheal, helping the rickshaw driver to push the cart along the gravel road. We stayed at the Vy Khanh Guesthouse, which was cheap and comfortable but about 2 km from the covered market. Since we were only staying overnight, my only goal was to get to that market and sample some of the Vietnamese food I had been dreaming about. Unfortunately, during our walk to the market, it started pouring down rain and we were forced to duck into the restaurant at Victoria Hotel instead. Not the dinner I had planned. Our wallets feeling lighter and our palates yet unsatisfied, we grudgingly took a taxi back to the hotel in order to keep the baby out of the rain. The next morning, the hotel arranged for a minivan to pick us up and take us to the bus station so that we could continue on to Can Tho. I went out early to pick up something for breakfast and snacks for the journey. I ended up walking farther than I expected and flagged down a rickshaw driver to take me back to the hotel. My driver had to have been at least 150 years old and I felt terrible making an old man pedal me but I had no choice unless I wanted to miss our bus. He had no idea where the hotel was (I probably pronounced the name wrong) and he set off in the wrong direction. He also did not speak a single word of English. In desperation, I tried French not really expecting him to speak it. To my happy surprise, he understood my directions perfectly and got me back to the hotel. I tipped him way more than I should have because I still felt guilty for having such an old man pedal my lazy, slow walking self on such a hot morning. We took a taxi to Xuan Mai 2 Hotel and wanted nothing more than to check in and take a nap. The hotel owner had other plans for us. Instead of giving us the keys and letting us go to our room, he kept insisting that we sit down in the lobby and discuss a tour to the floating market. We had planned on going to the floating market the next day but all we wanted at the moment was to go upstairs to shower and rest for a bit. Finally he let us go to our rooms after extracting promises that we would come back downstairs later to hear about the floating market tour. After a rest, it was time find something to eat. We were happy to see that the owner was not in the lobby so we just headed out to explore the city a bit. We didn’t get 2 blocks away before we saw the hotel owner running towards us. He tried to sell us a floating market tour again but now we were irritated and said that we would probably be leaving the next day and would not have time for a tour. He kept insisting and we had to fob him off again with a promise to speak to him later that night. 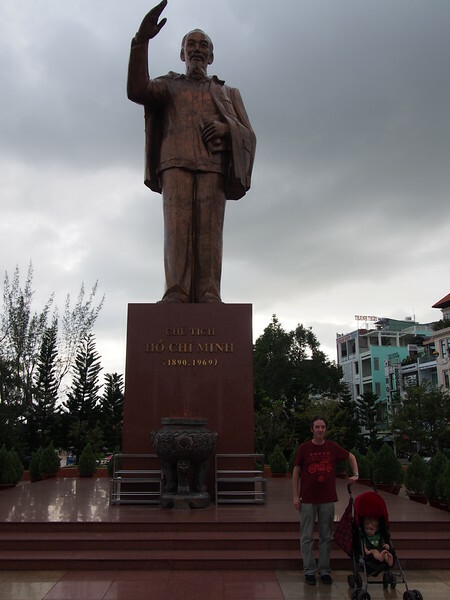 Requisite photo op with Ho Chi Minh statue. Everyone that we have met in Vietnam so far (except for that hotel owner), have all been friendly and helpful with big smiles for the baby. I have heard other travellers complain about getting ripped off or short changed in Vietnam but this is not something we have experienced yet. The food has been delicious here. I kept meaning to try the Bun Rieu Cua (crab soup) but never got a chance. It will have to wait until we get to Ho Chi Minh. I can’t figure out how to order a large iced coffee. I keep getting a tiny shot of espresso with condensed milk in a glass that is overfilled with ice. I must be doing something wrong because I see Vietnamese people walking around with a full glass of iced coffee. Later in the evening, we saw the hotel owner yet again! This time pedaling his way over to us on a bicycle. By now, Micheal and I were getting really tired of his sales pitch and told him in no uncertain terms that there was zero chance that we would book a tour to the floating market and that we would be leaving early the next day. We had to walk away while the owner was still talking. You think he would give up at this point but it wasn’t over yet. When we got back to the hotel, the receptionist stopped us and said that the owner had told him to call as soon as we got to the hotel. He called the owner who tried to get him to keep us in the lobby until he could get there. We refused and just went upstairs. We left Can Tho without seeing the floating market and took a bus to Ho Chi Minh City. The boat trip seems nice. I’m thinking of doing the same tour except in the opposite way. From Chau Doc to Phnom Penh. I’m afraid of getting seasick. How was the boattrip, was it a bumpy boat ride? No, the ride is not bumpy at all. 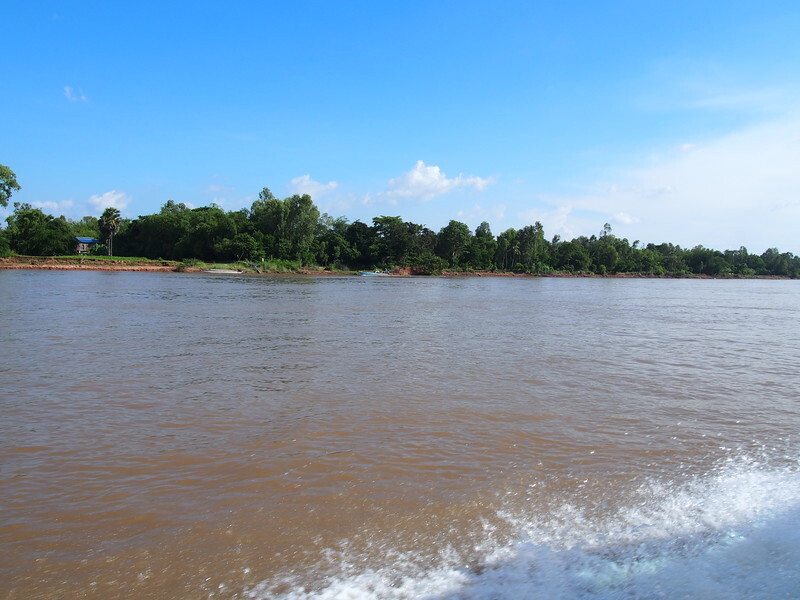 The Mekong river is very calm and nothing like being out on the ocean. Micheal tends to get a little seasick but this trip did not bother him at all. The scenery closest to Chau Doc is far more interesting than that closer to Phnom Penh. However, it will be a small boat and you will get started talking to other travellers and most of the time passes quickly. Because you are going the opposite way, you will not have such a long wait at the Vietnam side of the border. Have a great trip! Why would you put a baby through that ? What a strange question. The baby loves boats so he had a great time. We booked our boat trip and got our Vietnam visas through LMN Travel & Tours in Phnom Penh. They are located at #211 Sisowath Quay, on the riverfront. The bus from Chau Doc to Can Tho takes around 3 and a half hours. It is possible to do it by boat. 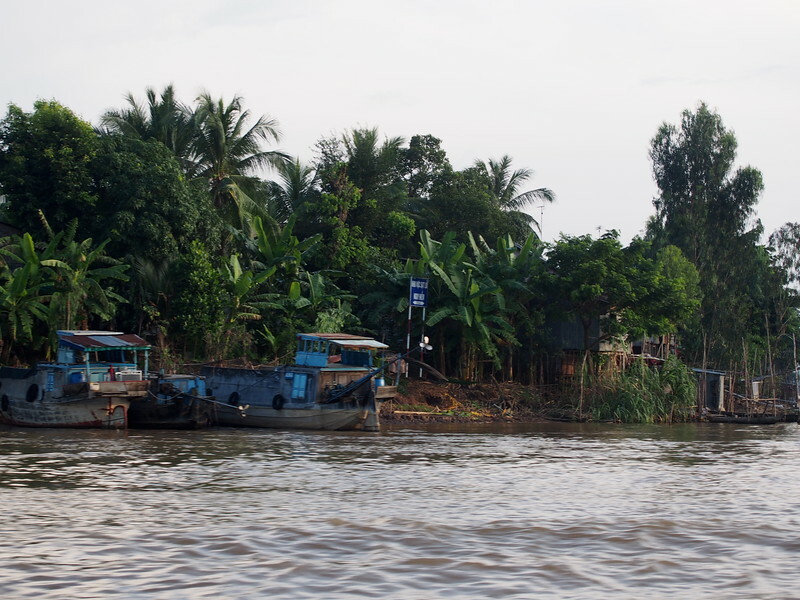 There were other “Mekong Delta Cruise” packages available from the tour agent in Phnom Penh. The bus we took from Can Tho to HCMC took under 4 hours but the bus station was a long way from where we were in staying in District 1 and we had t take a taxi so add in a little more travel time. If we are only in Vietnam for a week and then Cambodia for a week is it worth it to take the fast boat from Chau Doc to Phnom Penh? Or would it be better use of our time to fly from HCM to PP? It seems tricky and time consuming to get from HCM to Chau Doc, any advice is appreciated! It is an interesting trip but if you are really short on time it might be better to fly. There are lots of different tour agencies on Pham Ngu Lao Street (District 1) in HCMC. They all sell some kind of Mekong Delta Cruise. It is also possible to take a 6 hour bus from HCMC to Phnom Penh, that’s what we did when we were leaving Vietnam and it is a lot cheaper than flying. I am also interested in Lydia’s and Chrissy’s posts. We are traveling in November 2016 as well (hey Lydia, where are you staying? ), with a tentative plan of taking a boat from Phnom Penh to Chau Doc, then considering a bus to HCMC. We only have a few days to do all this so wondering if it’s worth it, or would we be better off just taking the 6 hour bus ride from PP to HCMC. Your baby will grow up to be so well-rounded and open-minded! Good for you! Heroic parenting I think. How long was the bus ride into HCM? And do you think it would be possible to do the whole trip (Pnom Pehn-HCMC) all in one day? Thank you! The “baby” is now 3 years old and currently on his second trip to Cambodia. I think it would be impossible to do the boat trip and get to HCMC in one day. The boat/bus/waiting around schedules just don’t allow for it. You could take the boat from PP to Chau Doc, spend the night in Chau Doc, and then get to HCMC the next day if you skip staying in Can Tho. You would only be missing the floating market and there are other floating markets in SE Asia. There is a bus that goes from PP to HCMC. It takes around 6 hours depending on how busy the border is. I think there may even be an overnight bus. Check with LMN Travel & Tours in Phnom Penh. They are located at #211 Sisowath Quay, on the riverfront. We have used them on multiple trips for getting visas or booking buses.